Show a listbox, when a cell with an Excel drop down list is selected. Select multiple items from the list, and all selected items are entered in the active cell. 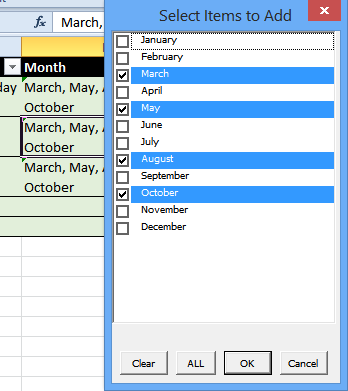 To make data entry easier, you can add drop down lists to your worksheets. Then, click the arrow, and select an item to fill the cell. Instead of allowing only one choice from the drop down, you can use a bit of programming, and allow multiple selections. To make it even easier to select multiple items, the sample file from this tutorial uses a listbox. When you click on a cell that has a drop down list, the listbox pops up, and shows all the choices. 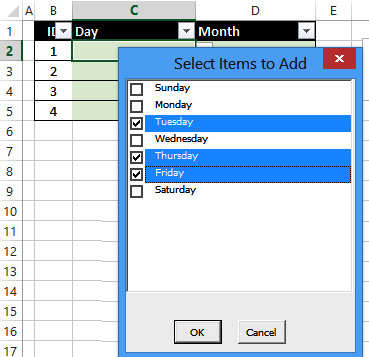 Add a check mark to one or more of the items, then click OK. All the selected items are added to the cell, separated by a comma and space character. 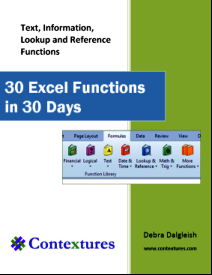 The sample workbook uses VBA code, which is set up to run automatically, when you click a cell on the worksheet. 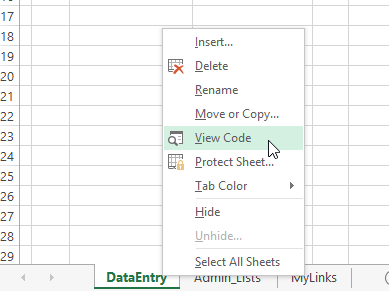 To see the code for the DataEntry sheet, right-click the sheet tab, and click on View Code. On the worksheet's code module, you can see the code that runs when you select a different cell. The code checks to see if the cell has data validation list, and then gets the name of the list. 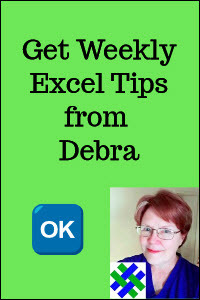 NOTE: This technique does not work for delimited lists that are entered directly into the data validation dialog box. It only loads named ranges, e.g. "MonthList", into the listbox. The last step in the procedure shown above is to show a UserForm named frmDVList. That form is already in the sample file, and it has a listbox, and two buttons -- OK and Close. There is also VBA code on the OK button, to get all the selected items, and copy them to the active cell. It then unloads the UserForm, so the listbox is hidden again. To experiment with this technique, you can download the zipped sample file: Select Multiple Items from Listbox. The file is in xlsm format, so enable macros when you open the file. 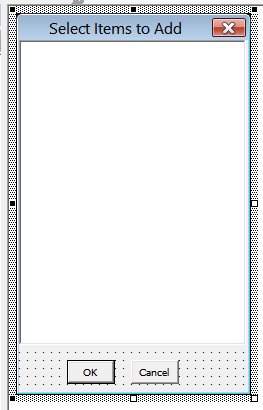 There is also a single selection version of the file, that lets you pick one item to enter in the active cell. In the premium version, the list box automatically selects any items that are already in the cell. It also has buttons to Clear all the selections, and select all the items. The premium version works with dependent lists too, and runs on a protected worksheet. There is also an option of showing a multi-select listbox, or a single-select version (this is helpful when working with dependent lists -- you don't want multiple items selected in the main columns).